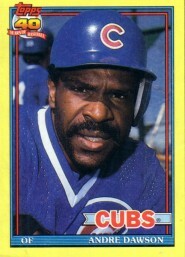 Hard to find 1991 Topps box bottom card of Chicago Cubs Hall of Famer Andre Dawson (#D). NrMt-Mt. ONLY ONE AVAILABLE FOR SALE.